One of the big touring surprises for 2009 has to be the visit of New Zealand’s legendary Axemen to U.S. shores. The band began in Christchurch in 1981 and stood somewhat aside of the pop path exhibited by much of the the Flying Nun label roster, but are without doubt one of the more fascinating Kiwi exports. Various live shows and releases displayed a loose but virulent amalgamation of avant-garage, Half Japanese style sax primitivism, confusion, and general air of maladjusted greatness. They’ve got two reissues “Big Cheap Motel” and “Scary!” out now on Siltbreeze, and are hitting the road coast to coast with Times New Viking. It’s a chore enough these days for any kind of overseas band to land a U.S. tour on any scale, so its was nothing less than a pleasant surprise when we learned that New Zealand’s Axemen had a pretty extensive one lined up with Columbus, Ohio’s Times New Viking this fall. The Axemen started in Christchurch in 1981, a time when New Zealand and Flying Nun records in particular were stirring up a major musical waves (ones that were felt in countless 1990’s US indie bands and are still being felt today especially disciples like TNV), yet the sweeping, strummy pop element that was evident in many of the Nun’s stable was only a part of the fuzzy picture that was the Axemen. The band’s central core of (Little) Stevie McCabe, Bob Brannigan, and Stu Kawowski recorded in both cheapo home mode and in traditional studios, but setting had little to do with the wide-swing of directions that are evident wherever you drop a needle (or cue up a tape). There’s tons of basement weirdness nodding to the more antisocial Velvets and Swell Maps moments, scatterings of drunken White Album recreation attempts, even moments where they sound like Royal Trux way before their time. When they played at Union Pool in Brooklyn last week I could swear they were going for a Stackwaddy/Doors thing, but then they became Half Japanese with Stevie playing sax solos on guitar. 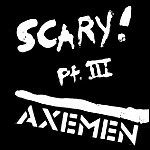 In Axemen recordings, they have one song about Elmer Fudd that sounds like Psychic TV, and another that is totally inspired by Grandmaster Flash. They even did a full album of Elton John songs. I have a feeling that if Flying Nun gave them the giant studio budget like they did Straitjacket Fits they would have come up with an album just as great as their Big Cheap Motel and Scary! Part III cassettes that Siltbreeze thankfully reissued in 2009. Check out the clip below (and more after the jump) of the band on a 90’s NZ kids’ TV show (promoting their Peter Wang Pud album! ), and dig in to their November 20th visit to my radio show, engineered by Jason Sigal and Alex Yockey.Thanks for Terre T for leaving us all the food the Reigning Sound didn’t eat earlier that day, there were some fancy pastries! You cand find more on the Axemen’s My Space page and Y2K blog,the latter of which has updates on sometimes-member Mick Elborado’s recent exploits at his workplace; he recently drove his car through the lobby of his employers’ building, New Zealand’s equivalent of the IRS. No one was hurt, but New Zealand’s government might be learning a thing or two about satisfying employees’ gripes in the future. This is our second set, like Phish. Sunday night shows are always a tough sell, but the four-band bill including U.S. Girls (who we’ll be up front and cop to not getting to the club in time to see) was as can’t-miss a show for indie rockers of a certain age as you’ll find. A healthy crowd of 40 or so (in their 40s or so?) crammed into tiny Kung Fu Necktie and watched as New Zealand ex-pat/Clean vet Hamish Kilgour and Lisa Siegel led The Mad Scene through a set of murky Kiwi-style noise rockers rife with alternating strumming and distorted jabs. That’s the thing about New Zealand: even their poppier indie pop is prone, at any second, to spiral into fits of SY-style noise fests. Kilgour, who apparently had lost his guitar strap, spent the first few numbers seated on the floor at the side of the stage — largely invisible to all but the front row — with a microphone stand angled down toward him, creating a scenario where the vocals seemed to be emanating from nowhere. Siegel eventually lent the singer her bass strap and Kilgour finsihed the set standing erect. Stu Kowowski of the legendary Axemen (who’d take the stage next), sat in on drums for the set and was joined by Adam Elliott, drummer for headliners Times New Viking, for a set-closing number where both drummers pounded on the kit. Then came The Axemen, a New Zealand noise/punk outfit on their first tour of the U.S. despite first slithering from of the antipodean ooze in 1981 in protest of the South African rugby team’s tour of the islands. Led by an apparently intoxicated Steve McCabe, the four-piece chugged through a set of classics, including a few choice numbers from Scary! Pt. III (a 1989 cassette that’s been recently re-released on vinyl by Philly’s Siltbreeze). The band, rounded out by guitarist/singer Bob Brannigan and in this incarnation bassist Dragan Stojanovic (the band’s lineup aside from the three core members has been in constant flux), turned in a rough-around-the-edges set (thanks mostly to McCabe’s inspired/drunken flailing) that alternated between all-out chaos and more crafted blues-rock tigned numbers that created as many questions as it answered. What must it have been like to watch this unit over the years, and what were these grizzled vets like in their younger, angrier days? A newer song that might be titled “Do You Wanna Be My Slave,” suggests the band’s as ascerbic as ever. McCabe (left) and Brannigan of The Axemen. Though The Axemen were indeed the rare treat that made this lineup a can’t-miss, Times New Viking was the main course. The Columbus-based trio have, since bursting on the scene with 2005’s Dig Yourself (which got the long-dormant Siltbreeze back in business) have honed a style that’s equal parts hooks cacophony, a slicing wail crossed with mistimed engine on overdrive. Keyboardist Beth Murphy’s vocals remain shouted and defiantly off key. Jared Phillips‘ guitar parts are piercing and devastating. Elliott’s drumming and singing are wound tight and delivered fast. They eschewed the typical set-encore structure for a two-set program that may have somehow crammed 30 songs into their hour on stage. It was exhilirating, ear-spitting, and so life-affirming. David Jerrold Theobald will have to pay for less than a third of the $41,500 damage he caused in his ram-raid protest at the Christchurch offices of the Inland Revenue Department. The 48-year-old remained disarmingly frank to the end, when he was sentenced by Judge Jane McMeeken in the Christchurch District Court today. When she began sentencing him for driving his car through two sets of glass doors at the department’s offices, he corrected her, explaining that it was actually three sets. “Don’t interrupt me,” said the judge. She ordered him to do 300 hours of community work and imposed reparation totalling $13,000 to the owners of the building and the department. She also disqualified him from driving for nine months. Theobald, who has now lost his job after working for the department for 25 years, had pleaded guilty to charges of reckless driving and intentional damage. He is now a sickness beneficiary but hoped to get more work. His ram-raid in his car at 6.30am on a Saturday was a protest about his ongoing employment dispute with the department. He will struggle to pay the reparations, even though he is single, has no children, and has been working for 25 years, because he has only about $1000 in assets. He lives in a rental property and has no car. “What have you spent your money on?” the judge wanted to know. Theobald explained that he had been generous to people. Defence counsel Simon Clay explained that there was a medical background to the case. Theobald’s actions had been a protest gesture. He had never been in trouble with the law, but had difficulties with his employer. He had checked to ensure there would be no-one in the offices when he made his protest. Judge McMeeken said Theobald had believed for some reason that what had been happening gave him the right to damage property, but the building did not just belong to the department. The man who drove his car through glass doors at the Inland Revenue Department building in Christchurch says he warned the department about terrorism but it had no security measures in place. David Jerrold Theobald, 47, of St Albans, pleaded guilty in the Christchurch District Court today to charges of intentional damage and reckless driving. He had worked at the Inland Revenue for 25 years and has said he had a long running employment dispute with the department. In the summary of facts read to the court, Theobald told the police that he had warned the department about terrorism but they had no security measures there. He drove his Mazda 626 through the foyer of the building in Cashel Street at 6.30am on a Saturday. He crashed through two sets of glass doors and smashed a third. Defence counsel Simon Clay asked Judge Stephen Erber to request a pre-sentence report for the November 17 sentencing. Judge Erber ordered a reparation report and a pre-sentence report, and prohibited Theobald from driving while he was on bail. A disgruntled Inland Revenue employee who quit spectacularly by driving his car through the doors of the tax department’s Christchurch building has been handed a hefty sentence of community work and ordered to pay $13,000 in reparations. David Theobald, 48, took his dissatisfaction with his employer of 25 years straight to the front counter at 6.30am on August 15. He crept his Mazda 626 up to the Inland Revenue building on Cashel St and, after making sure no staff were present, slowly drove through three sets of plate-glass doors causing more than $40,000 in damage. Photos of his exploits quickly emerged on the website of his band, The Axemen, and a Mick Elborado is Innocent page was set up on Facebook. Theobald pleaded guilty and yesterday was sentenced in the Christchurch District Court by Judge Jane McMeeken. Defence lawyer Simon Clay said Theobald’s actions were in the nature of a protest, the culmination of a conflict at work that had lasted for some time. There was a medical background to the offending, he said. Theobald had checked there was no risk to any staff and smashed the windows early on a Saturday. He had been “disarmingly frank” with police, admitting his crime at the first opportunity. The judge wanted to know why Theobald, a worker for 25 years, had no assets and no savings to make reparations. He said he spent his money on drinks for friends and “being generous”. The building’s owner, Rapaki Property Group, sought reparation of $27,000; Inland Revenue sought $14,500. The judge sentenced Theobald to 300 hours community work. Reparations of $8000 to Rapaki and $5000 to Inland Revenue were ordered at $20 per week from Theobald’s sickness benefit.